Events for Week of April 6th! 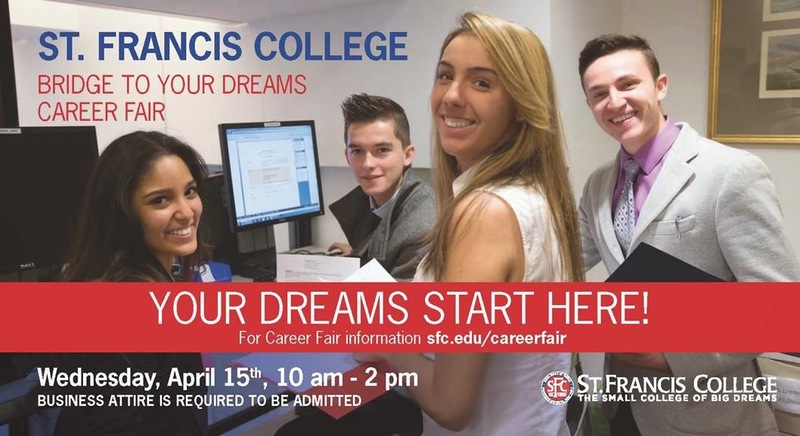 Hofstra students are invited to the St. Francis Annual Career Fair in Brooklyn to meet with over 140 diverse companies from all industries who are looking to recruit from various majors. Resumes and professional dress are required, but students do NOT need to register in advance. The final list of company attendees will be posted on http://www.sfc.edu a few days before the event. *This is not a Hofstra University sponsored event, for any questions please contact the St. Francis College Career Center at (718) 489-5360. Criminology majors are invited to an afternoon of service at The INN in Hempstead. The INN is a soup kitchen servicing the Hofstra Community. Join The Career Center and employers from the field of criminology for lunch at 1:00 at The Career Center. Then, we are off to The INN to assist them in sorting donations, stocking the food pantry, and getting them ready for the next day's guests. This is an opportunity to not only provide much-needed service to a local charity, but to engage with employers in your industry, who will share their stories and insight with you. Reservations are required and are taken while space is available. Registration is available through your PrideCMS account. Please contact Darlene Johnson in The Career Center at 516-463-5833 with any questions. Step right up! Come one, come all! Fun for all majors and all years! Grab your popcorn and cotton candy. Have your fortune told and learn what your future holds for you. Play some of your favorite carnival games with employers and find out about their available internships! We've got it all: games, prizes, food, music, opportunities, and more!